This activity has been selected for inclusion in the CLEAN collection. This activity has been extensively reviewed for inclusion in the Climate Literacy and Energy Awareness Network's collection of educational resources. For information the process and the collection, see http://cleanet.org/clean/about/selected_by_CLEAN. In Part A: Students examine graphs of glacial ages in the last 1,000,000 years and 150,000 years to familiarize themselves with the timescale associated with glacial and interglacial periods. Students also learn about the Milankovic cycles, cyclical variations in three aspects of Earth's orbit that result in changes to the amount of solar energy that reaches Earth, and are therefore believed to be responsible for ice ages and interglacial periods. In Part B: Students watch a short video about how ice cores reveal information about past climate. They then use Excel to explore and analyze 160,000 years of ice core data from the Vostok Research Station in Antarctica (Student Ice Core Data (Excel 2007 (.xlsx) 18kB Aug6 18); Teacher version with temperature calculation and sample plots (Excel 2007 (.xlsx) 48kB Aug6 18) . Optional Extension: If time and interest permit, students can learn about how scientists use ice cores from mountain glaciers in the tropics to study past climate. They will read a short background essay and watch the NOVA scienceNow video segment Tropical Ice Cores Measure Climate about glaciologist Lonnie Thompson and his research of tropical mountain glaciers. In Part C: Students will use an online interactive to explore how Earth's temperature, glacial ice, coastlines, and sea level have changed over the last 450,000 years. NOTE: Student computers will need to have an up to date version of Flash installed in order to run this interactive. In Part A: Graphs can be difficult for students to understand, especially graphs that go back in time from left to right. You might want to spend some time helping students wrap their minds around the glacial age graphs and what they mean. If students are struggling, consider printing the graphs on an overhead transparency and "flipping it over" so that time increases from left to right. 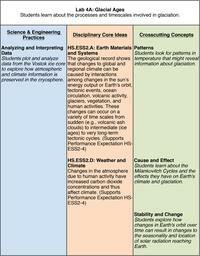 If students need extra support for understanding the Milankovitch cycles, direct them to one or more of the resources in the Content Extensions section below. In Part B: Before doing this activity with your students, it is recommended that you go through it yourself to familiarize yourself with the data and the procedures. If time permits, do the optional extension activity, Tropical Ice Cores, to show students another example of the cryosphere at lower latitudes. You might also consider assigning this section as homework if your students have access to computers outside of class. Have students write down the learning objectives for Lab 4. 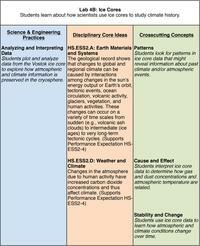 In Part B: Have students take notes and write down any questions they have as they watch the ice core video. In Part C: Have students take notes and write down any questions they have as they step through the EarthSwings interactive. 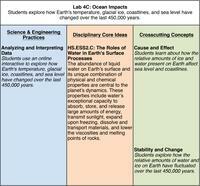 Explore background information and content extensions related to Lab 4. Past Variability Report (Acrobat (PDF) 14.1MB Jun14 11): summarizes the current knowledge of the past climate of the Arctic and discusses its relevance to key questions about present and future changes of relevance to policy makers and stakeholders. Vostok Core and Milankovic Cycles Climate Applet: Interactive applet (still under development) with animation and graphs designed to help students visualize the Milankovic Cycles. To supplement the ice core activities with a hands-on experiment, have students do the Ice Cores—Exploring the History of Climate Change lab from the Wisconsin Department of Natural Resources Climate Change Guide. NOTE: Allow up to 5 days for preparation before beginning this lab exercise with students. 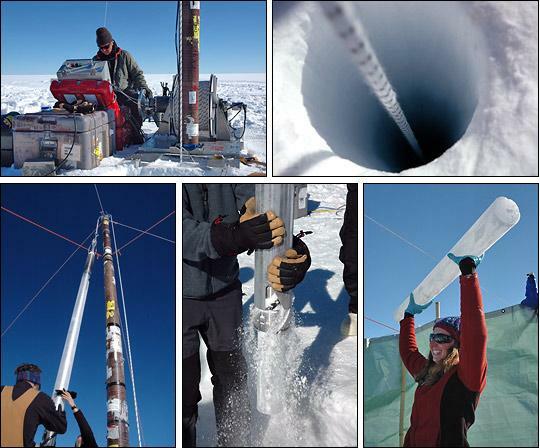 To learn more about ice cores, read the NASA Earth Observatory featured article Paleoclimatology: The Ice Record.